SPAIN - Spanish pork exports in the first nine months of 2015 increased by 17 per cent year on year, totalling 890,800 tonnes setting yet another record. Exports have been running consistently higher throughout 2015. The considerable investment taking place in the Spanish pig industry is resulting in large increases in domestic production which in the first nine months of 2015 was up 8 per cent on a year earlier and amounted to just under 2.9 million tonnes. Intra EU trade increased by 13 per cent between January and September. France, the largest market, recorded an increase of 7 per cent with the majority of pork going for further processing. Exports to Italy and Portugal were up from the previous year, by 9 per cent and 6 per cent respectively, in contrast to a 9 per cent reduction in shipments to Germany. Strong growth though was recorded in trade to Spain’s smaller markets in East Europe with shipments to Poland, Bulgaria and Romania all being up by 40-50 per cent year on year. Trade outside of the EU remained a strong growth market for Spain, with demand amongst some Asian markets increasing sharply. 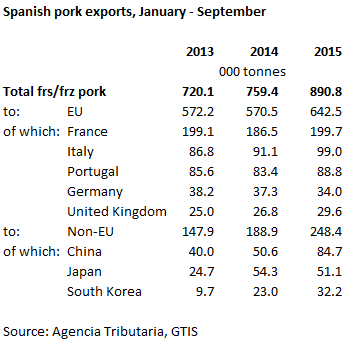 Spanish pork destined for China increased throughout 2015, with volumes increasing by two thirds compared to 2014. Purchases from South Korea also recorded an increase, of 40 per cent. In contrast volumes to Japan were down by 6 per cent. Domestic demand in Japan remains subdued, along with the steady rise of production which is reducing import demand. The unit price of Spanish exports for the first nine months of 2015 fell by 9 per cent compared to the previous year given both the weaker EU and global market in 2015. However, there was an increase in the total value of exports, up by 6 per cent to €1.95 billion, given the large growth in volumes shipped.